Ever since spending a semester shooting for the UNF Spinnaker, I've been broadening my horizons and photographing things I ordinarily wouldn't. This has primarily led me to doing more portraits (think family Christmas card photos on the beach...) and sports photography. I was curious about many different things for the competition. First and foremost, how would they light it, if they lit it at all? Obviously the judges had to be able to see what was going on, but would the lights be suitable enough for photography? (Now that I think about it, and I'm not sure how possible it would be, but it would be AWESOME if they found a way to suspend lights about 10 feet under water so the water was lit from below.) I also wondered what exactly a "tow-at" competition was. I was thinking it was like the surf competitions where the surfers get towed further out, away from the beach, to catch the bigger waves. That didn't make much sense to me as it's been my experience that the only time there are big waves in Jax Beach is if there's a hurricane offshore. 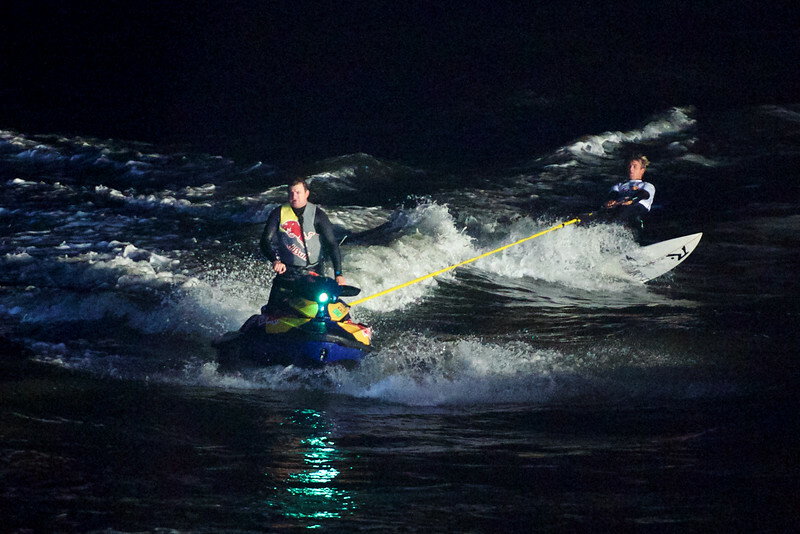 It turns out that a tow-at competition is kind of like waterskiing, but instead of a boat, they use a jet ski, and instead of skis, they use a surfboard. They basically go back and forth, parallel to shore, looking for the perfect wave to use as a ramp. The driver and surfer work as a team. When the driver spots a wave they know will work, they'll speed up to around 35-45 mph. Then at the perfect moment, the surfer will let go of the tow-line and launch themselves up and off the wave and perform some sort of aerial trick. It's amazing to watch. Here's a shot to show how they towing looks. 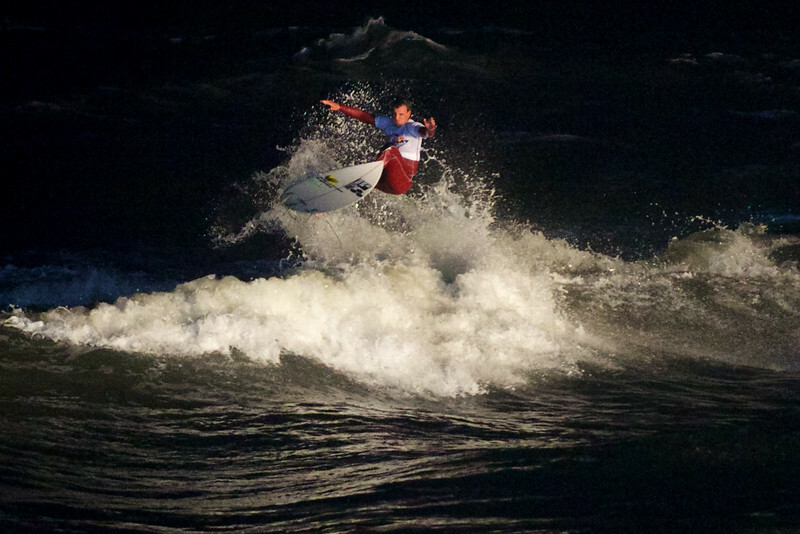 And here are some photos showing the crazy tricks these surfers were doing. Now I want to go and shoot a tow-at during the day. While it was great seeing a night time competition, I had to boost the ISO really high to be able to use a fast enough shutter speed to stop the motion and capture the image without any blur. I'd like to shoot one during the day to see how those images turn out and compare the differences between the day and night competitions. I'm not sure when the next event will be, but I hope I'm able to make it out. It was more fun than I was expecting and I had a great time.